"SuperAPP IS NOT an Application Format, It is an Application Management Solution"
October 13, 2009 - As mentioned in my last post, we are starting to see some really passionate and healthy dialogue taking place related to the college application process and how to improve access for all students. I feel this is a great discussion and a topic worth exploring. In various communications I have had with people on Twitter, or remarks I have seen on comment boards or in the text of feature articles, it has been implied, or directly stated, that SuperAPP is an application format. (For the purpose of discussion let me also define what I mean by “application format”… Application Format means the format in which the application material must be presented, assembled or transmitted. Meaning that the college must adhere to a particular format of an application… such is the case with the Common Application.) That is just not the case with SuperAPP – SuperAPP IS NOT an application format. It is an Application Management Solution. SuperAPP is far more comprehensive and was designed for a completely different use then an application format solution — in fact, SuperAPP is designed to work with and integrate into whatever college application format a college chooses, including the Common Application. So whether a college uses the Common Application, a custom application that they have created on their own, the Universal College Application, a CollegeNet application, or any other application format solution, SuperAPP can accommodate. 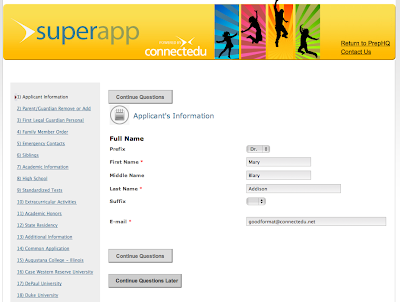 So does this mean that a student can use SuperAPP to complete a Common Application? Yes, it does. In fact, students using SuperAPP can complete their Common Application for Common Application schools while simultaneously applying to colleges that are not on the Common Application network and use a different application format. SuperAPP is a smart technology that interprets numerous college application formats, identifies the common characteristics, and then creates a single application for the student to complete based on the colleges that they wish to apply and the commonalities of those various application formats. Then, once the student has completed their single application, SuperAPP de-couples the single application into the original application formats of each college — a true application management solution. The Common Application requires colleges to adopt their format (but most have supplements which means that they all end up with their own “custom” formats anyway, eliminating the benefits for the student, but who’s counting) in order for them to make the process easier for the student. CDU’s SuperAPP makes the process easier for everyone – student, counselor and college – and nobody has to change their application format. SuperAPP even goes one step further. Because SuperAPP is deployed through Connect!, and integrated with the high school’s student information system, SuperAPP can pre-populate over 85% of the student’s applications before they even start the process. This is a HUGE time saver for students! As I have stated before, this is the best way to provide a streamlined process to as many students, counselors and colleges as possible. And, at the end of the day, every student, from every neighborhood across the country is given the best opportunity to achieve their dream of a college education and promising career. As always, I welcome your thoughts and comments via Blogger or via Twitter (you can follow me at CraigPowellCDU).